HORROR HOTEL (1960) Christopher Lee, Betta St. John, Valentine Dyall, Patricia Jessel. 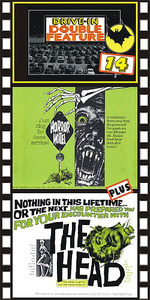 Classic British horror as a witch lures victims into a New England village for blood sacrifices to the devil. Creepy and atmospheric with a terrific climax that still packs a punch. A minor classic with a major following that's easily one of Lee's best. Highly recommended. From 35mm. Plus: THE HEAD (1959) Horst Frank, Michel Simon, Paul Dahlke. A must-see film! A serum that keeps severed portions of the human body alive is used by a mad doctor on its own inventors decapitated head. This guy is really loony tunes (his girl friend’s a knockout!). Chilling and atmospheric. A very gothic sci-fi horror film and one that we highly recommended. From 35mm.